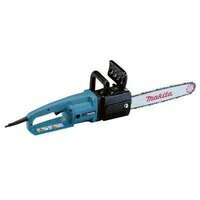 Chain saws typically operate with a manual or an automatic oiling scheme. Through the use of oil, the saw is kept from overheating while the chain and guide bar work. Oil also keeps the chain links from drying and the engine from excessive wear and tear. Two-cycle oil for the engine and bar oil for the guide such as Recochem, Electrolux and Warren Distribution combination oil is used on most modern chain saws. Despite the quality of the machinery, oil leakage is a common problem with electric chain saws that can be easily resolved. The transformer boxes or drum that sends your house electricity from nearby poles might be leaking oil. The oil can leak through the transformer wires. If this is the case, when you plug your electric chain saw into an outlet at your home your saw might leak. Phone your local electric or utility company and ask it to check the transformer for leakage. An oil reservoir that's too full can cause the oil to leak when you turn on the saw. Remove any excess oil from the reservoir if it's overfilled. The oil outlets around the clutch and sprocket might be clogged with oil. Sawdust can also get clogged in the outlets. Clean the clutch and sprocket assembly and check to see if the leakage stops. The assembly is located in a different area on each saw, so review the owner's manual that came with your saw to see where the assembly is. An excessively oiled guide bar can also cause leakage. To stop oil from leaking from the guide bar, take the chain links off the bar and wipe the bar clean. Return the chain to the bar, power up the saw and see if the leaking has stopped. A torn filler cap can leak oil through cuts or excessively worn areas. Look at the filler cap and seal. If the cap or seal is leaking or ruptured, replace the seal or the cap. Even after you have removed oil from the reservoir, the electric chain saw might continue to leak oil if the pump is dirty. Excessive oil on the oil pump gaskets can cause leakage. Wipe the gaskets clean and check them for wear. If the gaskets are ruptured, replace them. If the above doesn't work, contact a reputable dealer. Also, make sure that you get a warranty when you purchase your electric chain saw in the event that you have to return it for repair or exchange.